June 2015 – somewhat bookish. I am always on the look out for books with two mommy or two daddy households. Seeing yourself reflected in books is powerful, and while I don’t have any aversion to children’s books with more “traditional” families, I do crave books that show Frances a family like her own. 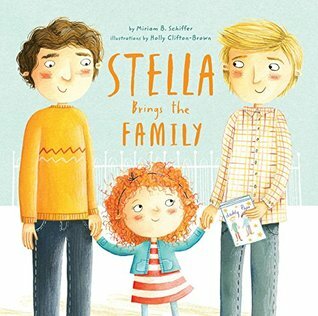 Stella Brings the Family, written by Miriam B. Schiffer and illustrated by Holly Clifton-Brown, is about a little girl with two dads. Stella’s class is having a Mother’s Day celebration, and Stella isn’t sure what to do. She doesn’t have a mother! Pros: Book features two dads! Two competent, loving, totally normal dads. AND another kid in the class has two moms! Good illustrations, pretty straightforward story. Cons: WHY is the lack of a Mom on Mother’s Days such an issue? There are no homophobic jerks in this book. And the problem is resolved easily enough (Stella invites her whole family). And YET – Stella agonizes for a week in the book about what to do. She feels anxious, is too distracted by this dilemma to play soccer one day, can’t sleep another day. I am SO ready for a book about queer families where the queer family is not the problematic plot point. Overall, I would actually mostly recommend this book. It’s a positive portrayal of diverse families. And every time Frances asks for this book, she says “And the boy has two mommies LIKE ME.” So clearly, this is a powerful thing, seeing a family like yours. I’m just still waiting for a book with queer families that isn’t ABOUT having two moms or two dads. Some day! Inspired by this article, I’ve decided to read only minority authors for the month of June. The lack of diversity in the publishing industry has been on my mind for a few years, since reading this article a few years ago about the lack of diversity in children’s books – and I make a real effort to ensure that Frances’ children’s books reflect the fact that she lives in a majority minority city, and introduce her to kids/life around the world. But I haven’t ever made a similar effort in my own reading. This is definitely an area where I could use work. Taking a look at what I’ve read so far this year, only 4 of the 47 books I’ve read so far have been by non-white authors. This makes me better than this year’s summer reading list by the New York Times, but not by much. I decided to give myself a month between deciding this and starting, so that I could do some research about good titles that I might like. I enjoyed Americanah (one of my 4 books this year), but it took me 6 weeks to read, and I generally read 6+ books a month, so I needed to make sure I had a good mix of more serious literature or non-fiction, and all the fun stuff I like to read: mysteries, children’s chapter books, and memoirs. Library Journal helpfully came out with this list of mysteries – and I’ve already starting (and am thoroughly enjoying) the first Blanche White novel. Otherwise, I did a lot of reviewing of ALA lists for children’s books – and googling things like “diverse memoirs”. This I think I highlights the problem with lack of diversity in publishing (and reviewing). Many of these books just aren’t coming to my attention through my regular sources (newspaper reviews, library blogs, the NPR books email, etc). That’s not right either, but in the meantime, I just need to expand where I’m looking. The #WeNeedDiverseBooks campaign is on this – and has a tumblr and twitter feed which make it easier to follow news and get book recommendations – but I’m always looking for more. Is there a place you get book recommendations that covers diverse authors and characters? Do you have any books to recommend?